Our Mega 3 Lane is a Monster! Our Mega 3 Lane is a monster! Not for the faint of heart, nor the lazy! Get your rear in gear for some high intensity competition! Three challengers face off in the challenge of a lifetime! They crawl through tubes, mosey up a hill, dodge inflatable pop-ups, soar to the summit and retreat down the 16 foot slide! Who will be the conquering hero? The Favorite? The Dark Horse? Who can say?! It’s a melee for the crown! Our FUNNEL CAKE maker and SNOW CONES are a great way to recharge before the next race. 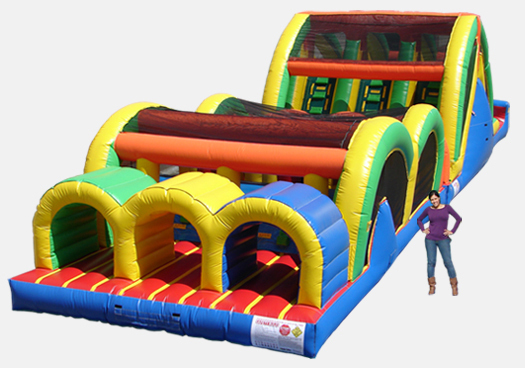 You might also like our X-TREME CHALLENGE or WAVY SLIDE as an addition to your event.